April 29, 2018 9:05 p.m. 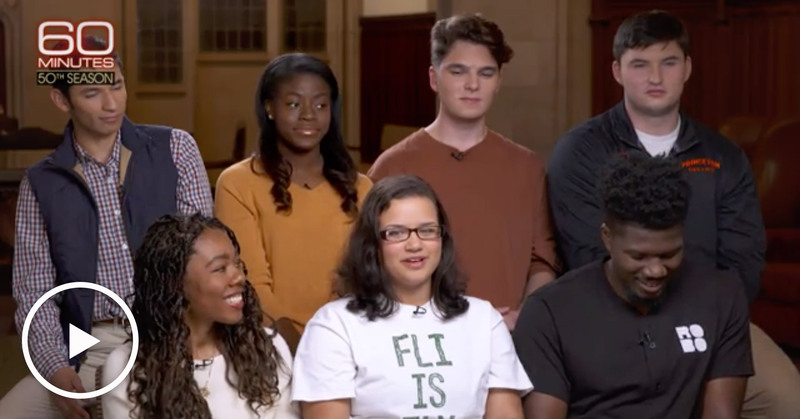 The CBS program "60 Minutes" featured Princeton President Christopher L. Eisgruber and several students Sunday evening, focusing on how Princeton and other colleges and universities are increasing college access and success for first-generation and low-income college students. "We have to be a place where people can come together from lots of different backgrounds,” Eisgruber noted during the program. “(T)his commitment we have to be a real leader on socioeconomic diversity is a big part of taking the next step for us and making the right kind of difference in the world." Eisgruber told correspondent Scott Pelley, "It's a new way of making sure that we have the diversity on our campus to deliver the kind of education that we care about and that the world needs." Princeton President Christopher L. Eisgruber walks on campus with "60 Minutes" correspondent Scott Pelley, who interviewed Eisgruber about the University's efforts to increase access and success for first-generation and low-income students. Pelley spent time on campus last fall with several "FLI" — first-generation, low-income — students. One of the students, Jaylin, was wearing a T-shirt that said "FLI is Fly." "So, 'FLI is Fly' is a campaign educating Princeton students on the resources available to first-generation low-income students," Jaylin said. "And also working to destigmatize the sort of first-generation, low-income, low-socioeconomic status." Pelley said that Eisgruber is "leading the nearly 300-year-old school through a radical transformation," noting that this year, 28 percent of Princeton's first-year students are first-generation or low-income, and 60 percent of all students receive financial aid. The transformation Pelley identified is the result of a range of efforts involving numerous offices across campus, including enhanced outreach to students from low-income backgrounds, improved abilities to recognize talented applicants from all backgrounds, and on-campus programs that provide first-generation and low-income students with mentorship, academic enrichment, leadership opportunities, and scholarly community throughout their time at Princeton. "I think it is a movement right now, at least among college and university presidents," Eisgruber replied. "I think there's a recognition that in this country right now some of the divisions that we need to heal are around economic class and we need to be paying attention to that." For a transcript of the broadcast, visit the "60 Minutes" website.